Here comes another weekend and as usual, we are planning to head out of town. That is when it strikes us there aren't many places to be covered by us in and around the city. One of my friends in a very sarcastic way tells us, 'let's go to a desert!'. That is exactly how Talakadu came to our mind. Since none of us had been there before and have heard numerous stories about the place, we decided to head towards Talakadu. Talakadu is at distance of 130 km by road. We begin our ride at around 6:30 AM and head towards Mysore Road. We decided to stop at Kamat Lokaruchi for breakfast. After the filling breakfast, we continued our ride to the destination Talakadu. 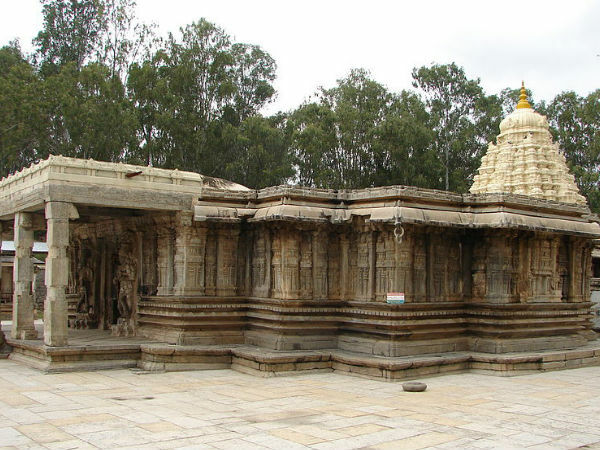 Talakadu used to be an impressive town with more than 30 temples, in ancient times. A Queen's curse buried the temple town in sand. Folklore and legends are hidden in every nook and corner of the town. Beneath the layers of sand is a town which witnessed the rise and fall of several kingdoms including Cholas, Pallavas, Gangas, Vijayanagar and Hoysalas. After three and half hours of driving, we reached our destination. Thanks to Google Maps, we went around the same place in circles. After finding a place to park, we walked towards the temples. Out of the 30 odd temples, only 5 have been found so far and the rest are still under the sand. We decided to head towards the temples. The first temple which we encountered was the famous temple out of the lot, Vaidyanatheswara which is dedicated to Lord Shiva. The structure was built using granite by the Cholas in the 14th Century. It is part of the Pancha Linga darshan which happens once in 12 years. The next was Keerthi Narayana, which was built by King Vishnuvardhan of the Hoysala Dynasty and was excavated in the year 1911. The temple is an example of fine workmanship. It is a temple dedicated to Lord Vishnu. Talakadu is one of the few places in India where the remote sensing technology is being used for the excavation process. An interesting fact which we came across is that every one of the five temples have high tendencies to get hidden under the sand. We found this to be true, an excavation was happening around the area to bring out the temples from the sand. There was a guide who narrated to us the story of the place and showed us an interesting carving on the Dwarapalakas (Door Keepers); the torso of these figures had a huge resemblance to the face of a bull. Of late, the place is gaining fame not for the hidden temples, but for Wine Tours. The place is often called as Bangalore's Gourmet Valley. The sleepy town now produces artisan cheese, fine wines, exotic pesticide free vegetables. This has been a close kept secret by many chefs who come to collect the produce from here. We decided to visit the Winery since it is something which we never excepted to be found in this part of the town. But to our bad luck, the vineyards were closed to visitors for the day. After that decided to ride back to Bengaluru. Talakadu is the place for those who like to revise the history classes that they had during the school days, or those who just want to kill their time.